If your nonprofit board seems bewildered over its true role, doesn't really understand the mission, allows the organization to drift aimlessly, squabbles with its executive director over authority and responsibility then get ready to have all of that disorder and confusion cleared up once and for all. 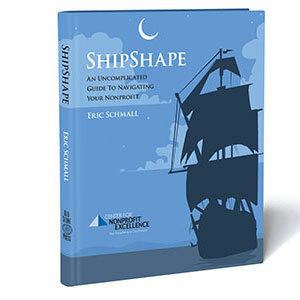 ShipShape offers your nonprofit a simple, engaging, and refreshing unique guide to governing and managing your organization. The guide book assures clear sailing into a wide-open ocean of absorbing ideas and stirring tales illustrating how to skillfully navigate your nonprofit to success. As the former State Auditor for Kentucky, I witnessed dozens of nonprofit organizations whose governance was lacking because their boards and staff were often unprepared and inadequately trained. This clear and compelling publication by Eric Schmall offers a valuable roadmap to put any nonprofit on the path to successful management. His inspired use of clever metaphors serves to actively engage the reader in learning from the helpful tools he provides.